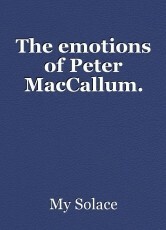 The emotions of Peter MacCallum. Following the life of Peter MacCallum, from his troubled beginnings and to all the joy and heartbreak that follows him throughout his life. Peter MacCallum didn't have the best start in life. His mother perished bringing him into the world - something his father never forgave him for. Yes, he clothed him, fed him and sheltered him, but he never loved him. He showed up when needed, to the football games, school plays and other things, but not out of pride of course, that would be foolish. As his father always said, “Peter, pride is for people who just haven't lost enough in life”, and the MacCallums had certainly lost plenty. The reason he showed up was to make sure no one would talk, whisper, and hiss about their situation. As Peter grew up, so too grew his resentment of his father. They constantly fought and bickered and generally only spent as much time with each other as necessary. At times they even came to blows, to which Peter's father would always win. There was many a time he went to school with a purple, brown, or nicotine yellow face, it was if there was a new colour for each new week. Everyone knew what was going on in the MacCallum household, but their heads were too buried in the sand to ever do anything about it. Because of this Peter hated his home town. It was a nest full of vipers who paraded themselves as puppies. His dream was always to leave it all behind and be able to find some place where he could be happy. When Peter turned 18 It was finally time. He bought the first bus ticket out of his hellish beginnings and planned his move to the big city. On the night he left he screamed at his father of things he truly thought of him. That if his mother was still alive today she'd be disgusted by the depraved, bitter, old man he'd become. Which caused his father in a drunken stupor to again try colour his face in bruises, but not this time. This time Peter left his father covered in his own spit, blood and bruises as he stormed out of his house, slamming the door behind him so hard the glass on it shattered. Freedom was finally here for Peter, no more abusive and bitter father, no more living in a rural nightmare of a town, and no more sadness. He could finally have a life and be happy. He found a flat for rent - the epitome of humble beginnings. It was two rooms that could barely contain enough essentials' for a civilized life, but that was okay he told himself, it was only a start and he shouldn't be there long. He also quickly found a job working as a kitchen Porter with plans to go to university once enough money was saved. And then he fell in love, and the air smelt fresher, the grass greener, as when he stared at her hazelnut brown hair and pale freckled face. All the pain, all the sorrow, was washed away by her beautiful personality, and sung away from ever returning by her sweet voice. He was the happiest he had ever been and would ever be, this amount of joy he once believed to be impossible. She was an artist, and writer; the way she viewed the world was unlike any other. She saw happiness in everything she had, did and saw. Peter and his love were inseparable and in the kind of love out of fairy-tales. Him the beast, and she the beauty who saved him. So while walking down a stone cobbled street beaten from overuse, under the city stars that shone against the river. Peter knelt on one knee and asked the only question in the entire world that he wanted the answer to. And then the darkness knocked on the door. KNOCK came debt – anything they earned went straight into there bills. Peter worked two jobs while his beuty had to put her dreams on hold to be a waitress. Not that there was much earned, as that is the hilariously morbid thing about minimum wage, it becomes a legal way to take the skin of a mans back. KNOCK came miscarriage – To feel the joy of creating a child then to have it taken away before it has even had the joy of looking into its Mother's loving eyes. It nearly broke Peter and his love, but he overcame it best he could, although he new deep down that he would never forget the life that could of been. Whether it was lying in darkness while sleep alluded him, or have it sneak up on him in any moment, it could be enjoying a drink with friends in a bashful mood, when a tear rolls down his cheek in memory of the child that never was. And KNOCK, comes cancer. Peter watched the love of his life wither to nothing more than bones. 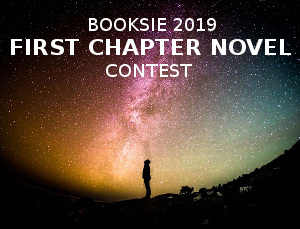 Near the end, as he stared at her cold sweating body, the white from her bones showing through her thin blue veined skin, her sunken eyes that betrayed the exuberant and loving eyes that they used to be. He wondered why the world hated him so. That it would give him the best possible thing in life - someone so bursting with goodness that it infected everything around her. Then to have it taken away in a most brutal and cruel fashion. Still staring at his beauty, he could see her now glowing. Getting brighter and brighter getting ready to travel the stars and join with the angels where she belonged. But for him it was different. For him the darkness was growing. Its long malicious roots entangling itself in the for now muzzled beast, and why shouldn't it! From birth the darkness has always claimed him. His beauty tried to save him from it but it must be destined for him to be the embodiment of misery. To cope with the horrors and tortures of life. That's the saddest irony of all, those who deserve and would appreciate happiness the most are the ones who are most starved of it. When autumn came and the wind claimed the leaves so too did it claim the last of her. If Peter ever thought he knew sadness before, it was only because he had never known joy. He headed into a downward spiral of pain, depression and sorrow. Any ambitions he once had turned to ash in his mind. He turned to drink to try relieve his unbearable anguish and when that lost its numbness, moved on to drugs. So with each new bottle and needle he whittled his life away wallowing in depression and self pity but never brave enough to give it all up. And with each passing day he stared at his reflection, seeing it twist and turn, twist and turn, until he could no longer tell if he was Peter MacCallum, or the man who had tormented and raised him all those years ago. Peter MacCallum made it to 65. He died in his once humble but now dismal two room flat, with a needle in one arm a bottle in the other, and with depression upon his mind. He died from an overdose of his ‘happiness’. Not the most uplifting of lives our dear Peter had was it? But it is a testament to the one true fact in our lives of confusing misconceptions and lies. What are feelings but just a way to express the things that torture us in life. Even happy feelings are there own torture, as they give us a standard to reach for. Joyful emotions are just addictions and we the junkies who bathe in its feeling of ecstasy, but eventually we fall and sober up. To the reality of life itself, this, the truth of the human emotion, the first and most destructive drug. Far more people have died of bitter loneliness and depression, than from drugs or alcohol, in fact these things drugs and drink and all other addictions are all used to fight the one true addiction. Emotion. We all try to achieve the feeling of happiness, and some may even perceive they have, but they can't! as that’s the lie of happiness. We must know sadness and depression to be able to know its importance, what cruel torture is that! That the more sorrow one has the more appealing and life saving happiness is, the more pain you have the better it feels. Is this what humanity is destined for? To spend its entire existence searching for the everlasting happiness, while doping ourselves up on artificial attempts of it as we try cope with the fact we won't have it. Life is a cruel existence and even crueller for its allure being too addictive to give up. © Copyright 2019 My Solace. All rights reserved. Memories that will never be.